Last week the The Digerati Life, a generally worthwhile blog, had a generally worthwhile post on market timing. (Bottom line: you really shouldn’t.) But it had a few sentences I keep rereading. I have in my portfolio two ETFs that track the movement of the Dow. One makes money when the market goes up and the other makes money when the market goes down. The only job of these ETF’s is to react to the overall market. The responsible thing that I do is to buy them both as a form of insurance. I buy both because I know that I cannot predict the market movements. That can’t be right. She didn’t mean that. That would be dumb. With the market warming up but still plenty scary, now is as good a time as any to go over the basics of hedging. A hedge is basically an insurance policy, something you do to get rid of a risk you got as a side-effect of something else you did want to take on. You like driving a car, but you don’t like the risk it will be totaled in an accident, so you buy collision insurance. In stock market terms, let’s say you were really keen on the prospects of Toyota and the car business in general. So you buy some of the company’s stock. But that exposes you to the Japanese stock market and to the Japanese Yen. If either goes down in value your Toyota stock will probably also go down, even if your predictions of Toyota’s success turn out to be true. If you are picking individual stocks to invest in, something I personally enjoy but do not recommend as a way to make money, then you may have the problem of too much exposure to the stock market. There are ten stocks you really like, but after investing in them your overall equity allocation is too high, say 60% of your overall investments when you’d be more comfortable with 40%. No problem. Just short the market, for example using Spyders (SPY) to the value of 20% of your portfolio. But if you are not picking stocks, for example just investing in index ETFs or mutual funds, then hedging is probably not for you. If you own a large block of Vanguard’s 500 Index Fund, but are concerned about the market, don’t short some Spyders. That would nicely cancel out some of your 500 Index position, but cost you an assortment of fees. Better to just sell some of the 500 Index Fund. Why short sell to hedge rather than use options to hedge? In your example, if you short the Japanese stock market ETF, aren’t you opening yourself up to a (potentially big) risk that the Japanese market goes up substantially, but your shares of Toyota don’t? I think his post assumes you are not (at least in this portion of your portfolio) wanting to invest in the Japanese stock market but rather in the specific company Toyota. Therefore, you are mitigating a risk that could externally affect Toyota. All in all, great post Curmudgeon, very insightful and one of the best ‘beginners guides to hedging’ that I have seen. Right. My question is simply, what is the advantage to hedging via a short sale rather than by buying a put? The best way to hedge risk is with something that correlates 100% with the asset being hedged. That’s why stock options are the best hedging tool. Whether buying a put (costly) as Mike suggests, or writing a covered call (little protection), or owning a collar, the position is hedged by varying amounts. But there is zero correlation risk. Hedging Toyota with a position in ‘the Japanese market’ does provide some hedge. But, the correlation risk is significant, and this is not a practical choice in the real world. As an example to explain hedging to a beginner, it’s a good choice. As long as that extra risk is mentioned. Agree, selling some of your holdings is the simplest hedge. But, options are appropriate as hedging tools for ETFs, and thus, even passive investors can benefit from adopting conservative option strategies. Nice! First I want to say that I am honored you read my blog . I love it when I get analyzed like this… ! Second, I’d like to mention that this was not a post I wrote but rather, I gave the floor to a good blogger friend of mine, Tim Parker, who runs elementary-finance.com. As mentioned, he hedges with ETFs, while I haven’t tried it myself. I agree though, that hedging is one way to mitigate some of the risk, but if you don’t do it right, it could just backfire and cancel out your gains. It’s just one other way to try to manage risk, albeit something more for advanced investors IMO. Mike – Options don’t last that long. You have to keep buying after your option expires. That can get expensive. You pay more for more downside protection. Frank – You have an Entries RSS and a Comments RSS, but both redirect to the same place. Anyway to open up Comments RSS? TFB, thanks for the explanation. I take strong exception to this comment. 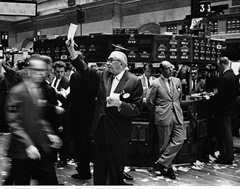 I’ve posted on the realities of stock investing (as discovered during the first seven years of The Great Safe Withdrawal Rate Debate) at numerous blogs. I’ve seen good reactions, medium reactions, and poor reactions. The author of Digerati Life does not understand it all. She is trying. She is doing better than a whole big bunch of others (including you, Frank, in my assessment). She is not dumb. It’s not a close call. You say in the first paragraph of this blog entry re market timing that “you really shouldn’t”. That is a nonsense statement (in my view, to be sure!). If you do not time the market, you are not paying attention to price. If you are not paying attention to price, you are failing at the ABCs of stock investing. Are you dumb, Frank? The bigger reality here is that our collective knowledge of how stock investing works is today primitive. There were some hot shot academics who came up with a theory that was proven by subsequent academic research (published 28 years ago!) to be false and they haven’t made the necessary corrections yet. So lots and lots and lots of people are confused. It takes a lot of work to learn the basic realities of stock investing when 90 percent of the “experts” are spouting gibberish 24/7. I know because I’ve made an effort to do it. We all need to learn how to invest effectively. Our retirements depend on it. The first step is developing the humility to acknowledge that perhaps the dumb investor is the man or woman we see when we look into the mirror. Perhaps we should be trying to learn what others can tell us to help us get on the right track rather than put them down. Is there some lack of logic in what the author of the Digerati Life is doing? Yep. That puts her in the same class as John Bogle, Jonathan Clements, William Bernstein, Eugene Fama, and many, many others. We’re all dumb when it comes to investing today. The proper way to overcome this deficiency is to stop putting others down and begin trying to learn some of the basics ourselves. That’s the harder job. It’s also the work that provides the far bigger long-term payoff. If you want to buy “insurance” (like she claims she is) then what you actually want are options. Options, like regular insurance, protect you in the case of an adverse event, but also allow you to participate in the upside of your insured position. In the case of the Toyota position, you could buy puts on the Japanese equity market. If the market tanks and Toyota goes down with the market, you make money off of your options. But if the market rallies and Toyota rallies in line with the market, you keep your gains on Toyota (less the cost of your options). Using options cost more than straight hedging, but you also have an asymetric risk profile– in your favor. * One big caveat– using short ETF’s (or double short, or triple short, or whatever) are not actually costless. In fact, they are not very good hedges at all, especially if volatility is high. Owning a short ETF means you not only pay for the cost of carry on the short, but because of the way they are structured, you also get hurt when the market is very volatile. Most of these ETF’s are structured to return the “daily percent change in the underlying exposure”. The result of this is that in choppy, volatile markets, you are constantly getting clipped (because percent change is different from dollar change). don’t believe me? run a scenario where the S&P is down -10% one day, up 22% the next day, then down 9% the next. After three days, $100 invested in the S&P is worth $99.9. But $100 invested in something that moves inversely to the daily changes of the S&P is only worth $93.50. Whoops. Still don’t believe me? The S&P at the end of August 2008 was about 1300. Today it is about 1000– a 23% fall. At the end of August, 2008, the Proshares Short S&P ETF (ticker SH) was worth $68. Today, it is worth $59– a 13% fall. Whoops. Buying a short ETF is a lousy long-term hedge. You get killed by carry and volatility. If you are worried about something happening next week, then they will work fine. But if you are worried about a longer-term risk, then you should probably sell some of your exposure. Or pay the option premium and buy insurance. I wrote an e-mail to the author of the Digerati Life blog letting her know about this discussion and I received a response in which told me that she posted a comment here and that it was removed. I of course do not know the precise realities. But I do know that I have seen a lot of that kind of thing at a log of blogs. I cannot say that it would shock and amaze me to learn for certain that it had happened once again. The author of the Digerati Life blog has not called anyone dumb. That’s a factor that I take into consideration in trying to figure out for myself what is going on. >So Silicon Valley Blogger owns two ETFs that >exactly mirror each other, such that the net >of the combination of the two is zero? >That can’t be right. She didn’t mean that. >That would be dumb. >>The two ETFs that I speak of in this article >>are DXD and DDM. If you are a new investor, >>I strongly suggest you wait a while before >>getting in to these. These are called >>leveraged ETFs and are mostly designed for >>day-traders. They move at twice the amount >>of the DOW which make them dangerous. You >>don’t hedge by buying 50% of each. You >>decide which way you believe the market is >>going and buy a majority of ETF that goes up >>when the market goes in the direction that >>you believe the market is going. Holding both at the same time still doesn’t make sense to me. If he wanted less market risk why not just invest less in the market? Wouldn’t that be better as it saves the management fees and any transaction costs? I guess I need to check my comments more often. First, an apology to SVB at The Digerati Life. She left a comment which was very inexplicably caught by my spam filter and held until I approved it just now. I don’t know why this happened. I think it is the third false positive I’ve had since I started using the filter. I’ve only ever deleted one or two comments since I started the blog and would never delete something at least vaguely on topic and non-obscene. I owe SVB a second apology because, as is obvious to everybody but me who read the referenced post, what I quoted was a quote from somebody else. These interwebs sure do confuse us old guys sometimes. On hedging with options: Options are a great way to hedge, but going short as in my example has its virtues. With options you have to pay a premium in cash to buy them, whereas going short you just swap a liability if the stock goes up for insurance against the possibility that it might go down. As Maxwellthedog points out, leveraged ETFs have serious problems for people whose holding periods are measured in days rather than hours. I’ll add another implementation issue I have with using DXD and DDM is that they are based on the Dow Jones Industrial Average rather than the S&P 500. The S&P is a much better representation of the US market and is more liquid. Yeah, this does happen sometimes. My spam filter has flagged a false positive on exactly ONE of my commenters. SPAM filters can be pretty dumb. My Yahoo email account thinks a lot of stuff is SPAM that isn’t. Saying someone did something dumb is not the same as calling them dumb. I do dumb things but I’m not dumb. I’m the one who actually wrote the article. First, many of the comments here are true. I would never hold both the funds at a 50/50 weight. Before I learned about options I used to hold both funds at different weights, trading around the positions. Due to reindexing and such it wasn’t a perfect strategy but the bottom line was that I made money. Using these funds with larger amounts of money, when looking at total returns, was well worth it. With the volatility of the market, when one fund was in the money, you bought the other fund at a discount. It worked like a charm. Bottom line is that you have to pay for a hedge somehow. It’s not perfect but the Toyota example above is far from perfect either. Puts can be quite an expensive hedge. Keep in mind that SVB and myself have blogs that attempt to give basic investing information. And yes, I agree that most of us, including many of the “experts” which I am not, don’t know everything that we should but I know very few people who do. I measure my knowledge on money. My portfolio makes money. Other than that, I’m not overly concerned with the amount of knowledge I don’t know. All we can do is keep learning. Saying someone did something dumb is not the same as calling them dumb. This is a great point, Jim. I often say that Passive Investing is “insane.” I certainly do not believe that the many millions of smart and good people who invest passively are insane. They are smart and good people who happen to be doing one particular thing that I truly view as “insane” because I have spent some time looking into it and that is what I have come to conclude as the result of applying my flawed reasoning skills to the evidence that I have been able to access in the time I have devoted to this matter. The point that I was trying to make above (it’s a point that I have tried to make lots of different times in lots of different ways) is that none of us really understand stock investing as well as we would like to today. If we all keep that in mind at all times, we will all open ourselves to a lot of learning experiences that otherwise would be denied us, in my view. It’s not what you don’t know that does you the most harm, it’s what you think you know for certain that just ain’t so. I am of course pleased to learn that it was a spam filter that caused the delay in us seeing the post by “The Digerati Life.” It makes me happy to see her as part of the group here. The markets are enormous, enormously complex, and often manipulated via inside information and such. There’s NO WAY to understand them fully. All of us (even inside traders) have imperfect information. We do the best we can.